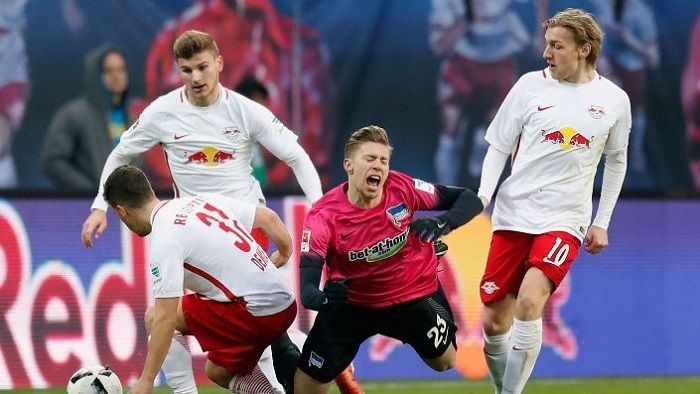 Hertha Berlin vs RB Leipzig prediction for the Saturday’s Bundesliga clash at Olympiastadion Berlin. Hertha brought themselves only to the tenth place in the Bundesliga standings, leaving no place for joy. What concerns the current season, Dardai’s men are much confident. They are now located on the sixth spot in Bundesliga, being only 5 points behind the leading Borussia Dortmund. We can see a potent game of the team: vigorous attack, but sometimes weak defence. The club has never lost a game on the home field. When it comes to meeting Leipzig, Hertha display courage and good spirit, since the last tour they managed to score some points against Borussia 2-2. However, predictions are made not in favour of the hosts, we should not question Hertha’s ultimate effort to achieve a winning result. The team vaguely spent the previous season and finished sixth in the UEFA Champions League, which hardly fulfilled the desires on the managers. Currently they are ahead of Hertha by the number of scored/conceded goals, and hence, ranking fifth in Bundesliga standings, adding on to the integrity of the upcoming meeting. Ralf Rangnick’s squad display ruthless attack and got a possibility to net a ball already 16 times in the ongoing season. But would they be able to reinforce the rate after clashing with Hertha? Previous game against Schalke 04 ended with a tie, which adds on to the team’s lack of confidence. On the other hand, Leipzig are now ready to redeem themselves in the fans’ eyes. Both teams display skillful attack with great number of goals. However, both teams are far from being impeccable in defence. Last three head-to-heads successfully ended in favour of Both to Score. Taking into account the above mentioned facts, we await for a spectacular confrontation with implicit goals scored from both sides. Fancy the prediction? More free reasonable predictions to spot in the corresponding section on our website.